If your playing is stuck in a rut, here's something that might unleash your creativity. Ease of use. Sounds. Drumbeats and easy time sync. Nothing, it's too much fun! 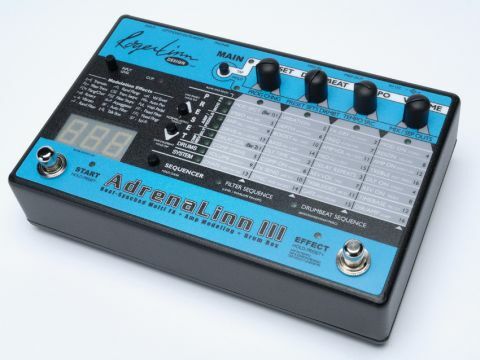 Now in its third generation, Roger Linn's AdrenaLinn is one of the funkiest, and most powerful, programmable guitar processors out there - and yet it remains firmly underground. The new update, however, is immensely powerful. The number of amp models is increased from 24 to 40 (including four bass amps) along with improved sound quality; we get a compressor and stereo reverb (with five room types), twice as many user presets (plus 200 user drumbeats), a tuner, improved functionality and MIDI and a slew of minor additions. With plenty of decent sounding amp sims to draw on, from an accurate Fender Bassman through to much higher-gained Rectifiers and the like, it's easy to get going here. The two-measure drum beats, obviously electronic, give immense stylistic choice but it's the ability to time sync the modulation and filter effects and delays that create the AdrenaLinn's unique groove parts and transform a bland chord progression or riff into something altogether more interesting. A well-written manual and intuitive user-interface mean you're making music quickly too. If you're into finding new rhythms and textures the AdrenaLinn III has to be explored. For simple sketch pad ideas, or creating parts both live and in the studio, the AdrennaLinn is unique and inspiring, with plenty of old-style tones and modernistic sounds onboard.